Awhile ago, Walmart started offering Grocery Pickup. You just order your groceries online and then check-in when you park in a designated spot. You never even have to get out of the car! While that’s awesome, wanna know what’s better? Walmart Grocery Delivery!!! Right now, you can get your first three grocery deliveries free! If delivery is available in your area, the Walmart grocery landing page will feature a different coupon code that is good for one free delivery. Make sure you use the code DISCOVER instead to get three free deliveries! Walmart’s Grocery Delivery is a game-changer. Here are 5 reasons I’m loving Grocery Delivery. Grocery shopping with the kids means I always end up forgetting things and picking up things I didn’t actually need. Getting the grocery shopping done without the kids is always a plus. I can add things to my grocery cart online while I think of them throughout the day and then place my order to be delivered the next day (or later in the week). I can shop on my own time and select the hour I want my groceries delivered. When I walk into Walmart to grocery shop, I end up with so much extra stuff. I’m sure I’m not the only one. When I grocery shop online, I can sit down with my shopping list and weekly menu to make sure that I have every item I need (and not as many random purchases). Okay, that sounds a little crazy, but… it shows my popular items for me to reorder. I can grocery shop online in my pajamas. And when the Walmart delivery driver pulls up to my house? I can still be in my pajamas! 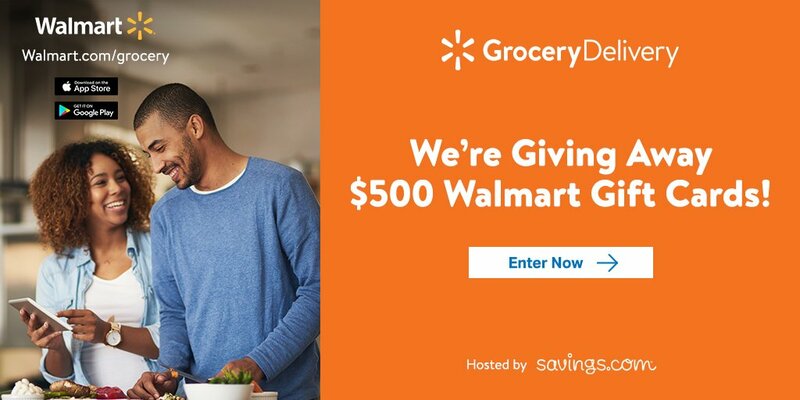 You can enter to win one of 10 $50 gift cards from Walmart being given away by Savings.com by clicking here or on the image above! 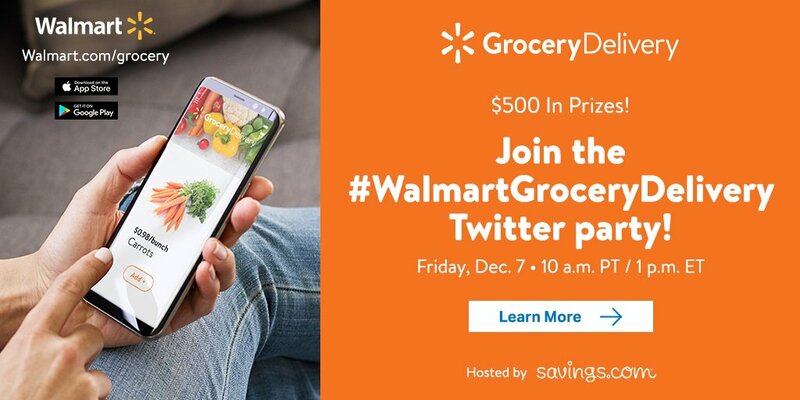 Make sure you RSVP for the #WalmartGroceryDelivery Twitter party on December 7th! We’ll be tweeting about Walmart and all the ways that grocery delivery makes people’s lives easier. Plus, we’ll be giving away $500 in gift cards from Walmart, so be sure to RSVP to be eligible to win!